General Electric 85-Watt Red Incandescent light. Approximate energy cost per year with normal use is about $12. Incandescent lamp will provide up to 1.8 years of use on average. Works with most 120-Volt lighting fixtures. Incandescent lighting is commonly used for decorative, office, residential, and special purpose lamps. Light is well suited for most Outdoor lighting applications. Using the 85-Watt Incandescent lamp provides about 2000-hours of rated running life, which means replacing your bulbs less often. Red light adds a unique touch to your projects, use GE lighting to finish the job. Incandescent lights from GE represents the state of the art lamps for residential, commercial, and special purpose use. Lumens are the new Watts, use this number instead of Watts to determine the light output or brightness that you prefer. A lumen is a unit of measurement for how much light is contained in an area. The higher the lumens number, the brighter the light. 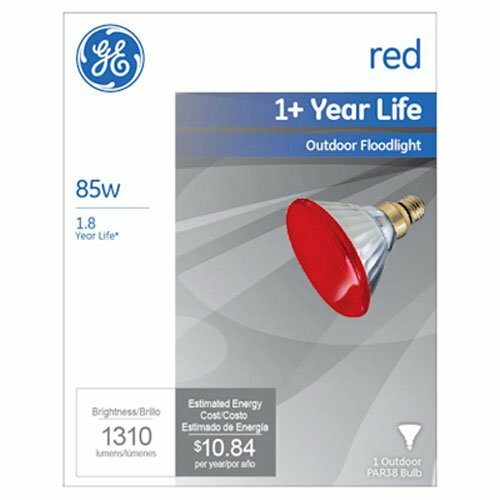 Package of 1, Manufacturer Code Description: 100PAR/R/85WM6PK For product questions regarding GE Lighting products, please call GE Hotline 1-800-435-4448, Monday – Friday, 8:00 a.m. - 6:00 p.m. EST Follow the recording prompts or ‘stay on the line’ to speak directly to a customer service rep. If you have any questions about this product by GE Lighting, contact us by completing and submitting the form below. If you are looking for a specif part number, please include it with your message.